What is the definition of a "private game" as it applies to the world of poker? 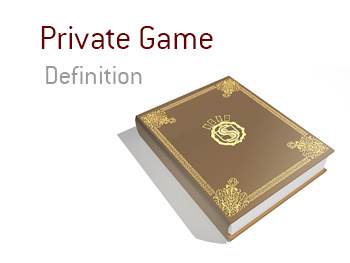 What is the definition of a "private game"? In poker, a "private game" is one that occurs outside of the confines of an online poker room or brick and mortar casino. In many places across the world, a "private" game of poker that has money changing hands is illegal (there have been numerous arrests for the playing of private poker games in the United States, for instance, over the past number of years). A private game can be as simple as two friends playing together at a kitchen table and as elaborate as a house hosting multiple full tables with hired dealers, rake, refreshments, etc. For instance, some of the "private games" that take place in Los Angeles are legendary. Names such as Leonardo DiCaprio and Ben Affleck have been rumored to take part in these games. In these cases, there are hired workers to perform tasks such as dealing the cards, refreshing the drinks, etc., and there are often millions of dollars on the line. Tobey Maguire, who famously played "Spiderman", is rumored to have won millions of dollars in these games. Playing in "private games" heightens a number of risks, including the possibility of getting robbed, arrested or cheated. If you are playing in somebody's private game and don't know the other participants and/or the person hosting the game, you are running the risk of getting cheated or worse. Sure, casinos change a rake in order to play in their games, but at least you know that you are safe and have security nearby at all times. There have been numerous cases of people getting robbed and/or arrested in private games in the United States.